The college basketball madness calls for some great simple crowd-pleasing grub for your game day gathering. With winter behind us it's also a great time to dig out the grill. That is, if you put it away in the first place. Italian sausage sandwiches are a classic, but they don't really lend themselves to mass production for a crowd. Sliders are all the rage these days, so I've merged the two in a way that allows simple preparation that's done entirely on the grill. This frees up your kitchen and gives you an excuse to enjoy the spring weather. 1 large White onion, sliced to 1/4"
Note: You'll also need a 13x9 disposable aluminum baking pan. 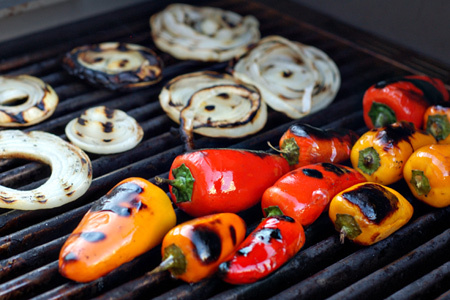 Start your grill and prepare for direct and indirect cooking (heat to one side) at medium heat (350-375º). Grill the onions and peppers until they are softened and charred on both sides. Remove them from the grill and set aside. Line the bottom of the 13"x9" disposable aluminum baking pan with parchment paper (I didn't, but should have). Slice the rolls in half horizontally and put the bottoms in the pan. Spread the marinara sauce evenly over the bottom half and sprinkle evenly with cheese. Remove the tops from the peppers and rough chop them along with the onions. Spread the pepper and onion mixture over the cheese. I added the peppers and onion during the assembly, which was dumb. Cover the pan with foil (I didn't, but should have) and cook on the indirect side of your grill. Quickly toast the tops of the rolls over direct heat then set aside. Quick aside: Can you tell that I didn't bring my culinary A-game that day? Oh well... We live, cook, eat, and learn. 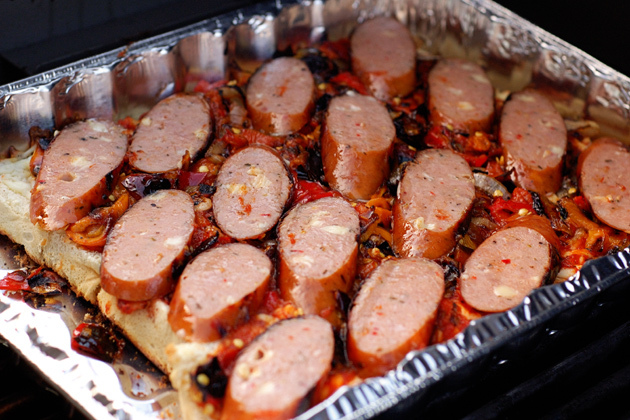 Cook the sausage over direct heat until they reach an internal temperature of 145º. Slice the sausage at a steep angle to 1/4" thick. 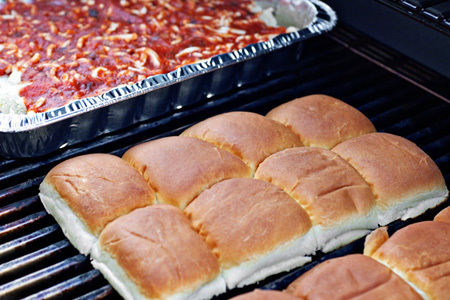 Uncover the pan and arrange the slices evenly over the rolls. Cover with the roll tops, slice, serve and enjoy! Disclaimer: I'm a member of Johnsonville's Big Taste Grillers Panel and I was provided the sausage for this recipe. I think my favorite part about this post is the way you wrote it. I make mistakes all the time-we all do-but it's rare to see then admitted and corrected in blogs. This recipe is a great idea and is on my to-do this spring! Thanks Kevin. I try to keep it real. If you try the recipe please swing back by and let me know what you think. 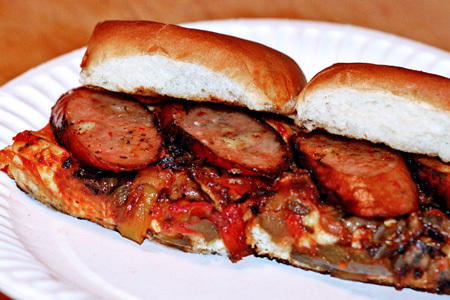 It's hard to beat a great grilled sausage sandwich. 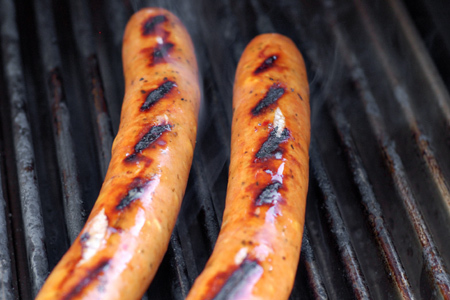 They always remind me of smelling grilled sausages at carnivals and festivals. Chris - I agree. I am a sucker for a sausage sandwich just about anywhere and anytime. Erika - Welcome, and thanks for your very kind words. Check out my recipes page (link in the upper-right).